Featuring paintings by David Wachs, Central Oregon Winter Drama, thru January 28. The artists will attend the January 5 opening. David Wachs set a personal residency record living in the Tumalo & Bend area since 1992. 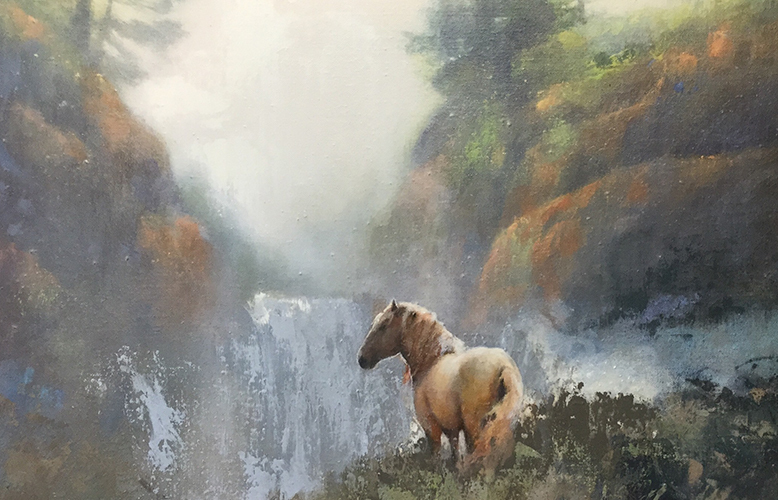 Surrounded by spectacular beauty & painting these dramatic natural scenes bound him to a ranch in Central Oregon. Wachs’ exhibit reflects his affection for Central Oregon, his chosen home base, employing a “loose, gestural approach to surface quality & texture, building my paintings from a peripheral perspective not unlike what you might see out of the corner of your eye while driving.” His paintings invite both close observation, noting harsh edges, separation of colors & brush strokes, or distant contemplation of sweeping, vast areas such as those of the Cascade Range. His work appears in private & public collections including Citi Bank, Bank of the Cascades, U.S. Bank (Portland), MODA (Bend), the Bend Bulletin & Oregon Public Broadcasting. The Franklin Atrium (and Bond St. entrance) exhibition is open from 7am–7pm. During First Friday, Noi Thai serves wine & appetizers & The Tommy Leroy Jazz Quartet entertains. Billye Turner, art consultant, curates the Franklin Crossing displays with info at billyeturner@bendnet.com, 503-780-2828. Gallery Hours: Mon-Fri 10am-7pm, Sat 10am-6pm, Sun 12-5pm. Exhibit admission is free. Presenting its first photography exhibit, Alyson Belcher: Ice Portals, thru January 28. Opening reception First Friday, January 5, 5-9pm, art talk Tuesday, January 9, 6pm. Photographer Alyson Belcher recorded the freeze & thaw of ice formations during the unusually cold winter of 2017 in Bend. These studies read as abstract landscapes & challenge our sense of scale. Lines, shapes & textures combine with the mysterious qualities of light & shadow to create a confusing space that is fragile & fleeting. Based in Oregon & California, Belcher is a full-time faculty member of the School of Photography at the Academy of Art University in San Francisco. Her varied oeuvre reflects an overarching interest in subjects that change slowly over time as well as a desire to test the boundaries of her medium. Also on display in January, featured A6 Member Carolyn Platt exploits her medium’s affinity for rapid mark-making & translucent layering in this series of expressive, abstracted monotype prints. Platt will be printing in the studio during First Friday, January 5, from 5-7pm. 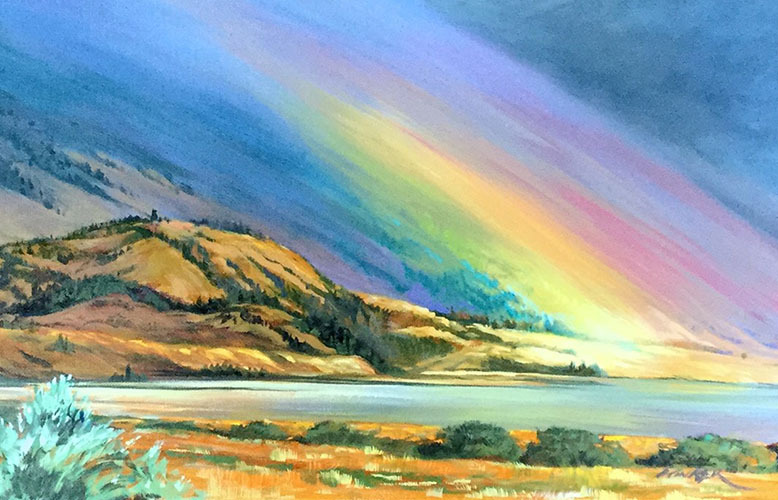 Presenting a new installation of paintings by Central Oregon artist Barbara Slater. Just in time for the holidays, don’t miss Slater’s newest collection of oil paintings including Raven Bros, a wildlife painting using vivid color to capture this iconic symbol of good luck. Features American landscape & fine art images captured by Bend nature photographer, Jeffrey Murray. 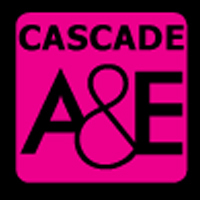 Visit & enjoy a visual adventure of illuminating light & captivating panoramas from scenes in Central Oregon & across North America. Specializing in unique, one of a kind wedding & engagement rings in a variety of metals. 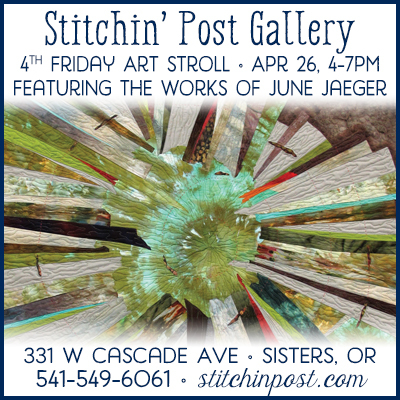 Junque in Bloom presents an exhibit by SageBrushers artist Kendra West. Watercolor is Kendra’s favorite medium. She says she is fascinated by the amazing world of watercolor. Also, she likes to experiment with different styles & subjects & is drawn to trying new techniques. 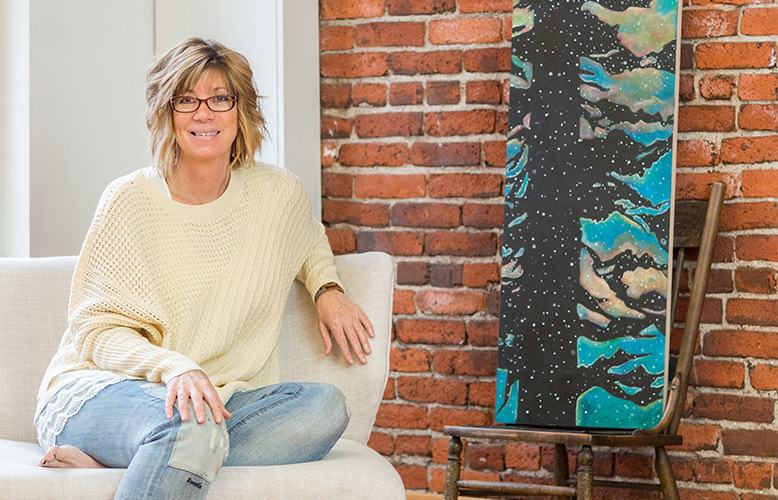 Tucked between Thump coffee & Alleda Real Estate, Karen Bandy a Central Oregon national/international award-winning jewelry designer & abstract painter, specializing in custom design in downtown Bend since 1987. Her designs are bold, fun & very wearable. Open Tuesday, Wednesday, Thursday 11:30am-5pm, First Fridays & by appointment. January First Friday at Layor is featuring Layor Art’s own Lori Stites, Kathleen Branch, Bitsy Tandem & owner Lacey Champagne. Enjoy an evening of art combined with an eclectic mix of visual delights & complimentary beverages. 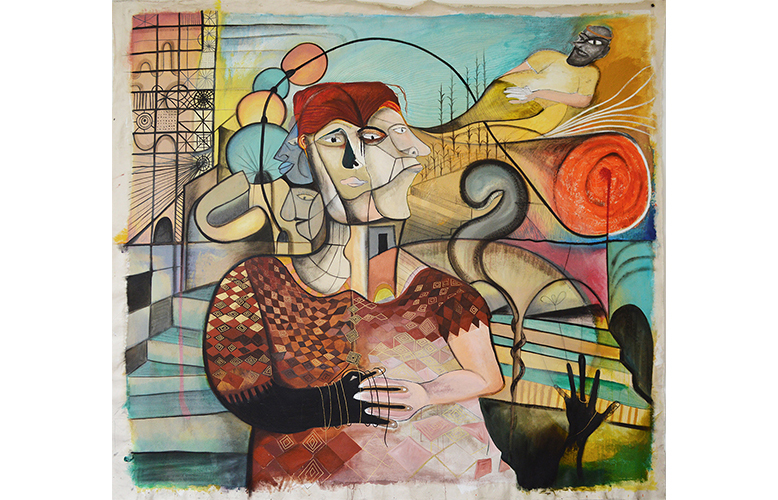 The Lubbesmeyer twins offer a range of work created in fiber & paint. Through the twins’ collaborative process, they distill literal imagery into vivid blocks of color & texture, creating an abstracted view of their surroundings. Working studio / gallery open Tuesday thru Saturday. Mockingbird Gallery will feature Jennifer Diehl’s new oil paintings on First Friday, January 5 from 5 to 9 pm in a show titled, Bending Light. Come down & meet Jennifer, have some wine & enjoy the jazz stylings of Rich Hurdle & Friends. On Saturday, January 6, Jennifer will be giving a live demonstration from 11am-2pm at Mockingbird Gallery. The show continues thru January. Jennifer currently works as a full-time painter in Oregon where she teaches & travels monthly for workshops, shows & plein air painting. The Oxford Hotel celebrates the New Year presenting Dorothy Holmes’ acrylic paintings of fanciful women & colorful abstracts opening January 1. Holmes will attend the champagne opening on First Friday, January 5 from 5:30-7:30 pm. Thru February 23. Dorothy moved to Bend & began Tall Girl Studio in April 2014. With talent both for portraiture & figurative artwork, she also paints abstract imagery. Her varied skill is evident in the series Women in Nature as well as her abstract landscape series suggesting sky & land meeting at horizon. All works are created with acrylic, India ink & pastel painted on birch wood. Painting professionally for over 25 years, the artist is largely self-taught. Her first formal art class was at Cambridge University in England & she has painted continually since that time. She participated in numerous instructional art workshops as well. Holmes is the featured cover artist for this month’s Cascade A&E. Peterson/Roth Gallery starts the 2018 season & its second year by sharing with you some of the talented work of the 16 artists we represent. The gallery will be hung with fresh art for First Friday on January 5 from 5-9pm. Come join us for some wine, cheese & fun. A few of the artists will be on hand to answer any questions you might have. We are located beneath Silverado next to Bend Alterations. Just follow the black staircase railing to find us. Thru January. Our focus for January turns to two very talented member artists as we ring in the New Year. Nancy Hoyt has been expressing herself in silver, gold & gemstones for over forty years. She creates distinctive jewelry that ranges from whimsical as in her trailer & goddess series to very sophisticated works & offers something for every taste & style. Justin Nelson began Fernweh Woodworking several years ago. His business focuses on modern design utilizing natural hardwoods. Pieces range from beautifully crafted furniture to small home decor items, each one a work of art. Grief is the universal language. Whether through death, divorce, illness, loss of dreams, feelings of loneliness or abandonment, or ecological & social upheaval, grief is a normal, human experience. Journey into the sacred art of grief & discover how the pain & suffering of living is transformed into a place of personal empowerment — within the self, in relation to others & one’s engagement with the larger community. Indeed, grief & darkness deserve gratitude. Grief is an opening which allows healing & growth so that we may live into the beauty of who we are, & to find ourselves within one another. Just as we all live with grief, creation is a human calling. The brave graduates of the Good Grief program, including teens & adults from the community as well as men from the Deer Ridge Correctional Facility in Madras, have volunteered to share their newfound beauty of well-being with the larger community of Bend. We offer a visual representation of the transformation of grief through the offerings at Good Grief Guidance. From weavings, paintings & photographs to poetry, love letters & personal mythologies, the channeling of the creative spirit enables us to reshape our life story so that we may thrive in the face of suffering. Please join us for food & drinks as we celebrate the loving wholeness which is ever present within each of us. For the months of December & January, Sage Custom Framing & Gallery will be featuring a show entitled Small Works. As the title describes, all the pieces in the show will be of a small nature — any medium, any subject matter & by a wide variety of artists in many styles. Thru January 27. Printmaker Adell Shetterly exhibition, All I Want to Do (is Print! ), original prints. Inspired by an exploratory spirit, Shetterly draws on encounters with nature, memories & moments to imagine & create. Her prints often integrate abstraction, color & texture to inform inventive & expressive artworks. Shetterly’s printmaking techniques include investigations in relief print, monotype & monoprints giving the viewer a glimpse into the patient technical procedures & design possibilities that underpin the celebration of printmaking. “When truly engaged in art making time stands still. Lost in creativity & exploration the artistic vision evolves…moving forward or backward…and perhaps it begins anew with a spark of innovation. Motivated to be present in this state of discovery I savor the journey traveled in creation of art.” Thru January 31. Artists at Tumalo Art Co. have gathered paintings, glass & sculpture to brighten the depth of winter with memories of summer, holding over our December group show, Summer in Winter. Reception during the First Friday Gallery Walk from 4-8pm, January 5. Come & celebrate the New Year with us. January is a great time to begin or add to your art collection. Throughout the gallery are small & medium sized works, along with larger pieces that are perfect to bring a new spark into any decor. Along with paintings choose from jewelry, ceramics, glass, sculpture & more.